The Iron Bull, to Solas: "Half our targets never even see you coming." One of my favorite things about the character of The Iron Bull is the way he lets us know, as the game's story and interpersonal character banters progress, that he's very much aware of the characters who are hiding something from us—most notably, Solas and Blackwall. 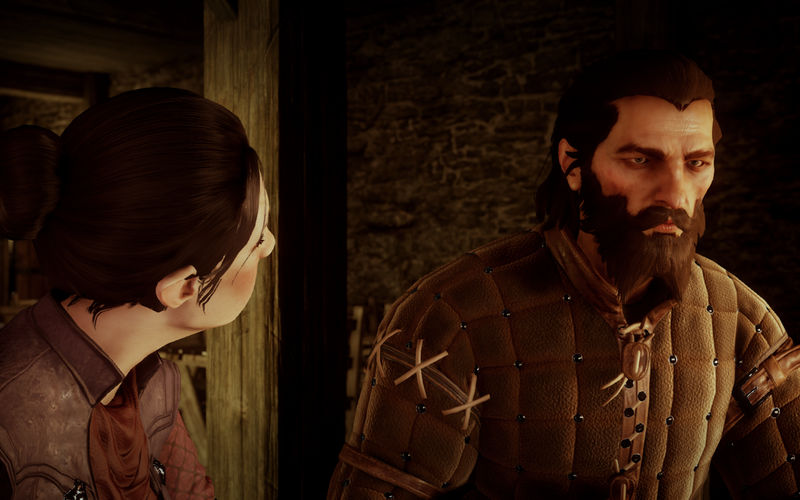 Both Solas and Blackwall are hiding huge secrets from the Inquisition for most of the storyline of the game, so it's interesting to examine Bull's conversations with them afterward only to realize he was onto them much earlier than anyone else. Iron Bull: You've got an odd style, Solas. Your spells are a bit different from the Circle mages or the Vints. Solas: That comes from being self-taught. I discovered most magic on my own, or learned it from my journeys in the Fade. Solas: Or without magical training, you cannot notice the parts of my magic that "clunk." 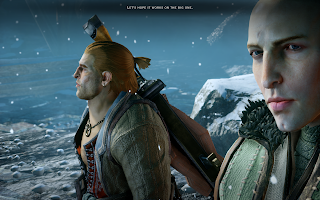 Iron Bull: You're not as flashy as most mages, Solas. The Tevinter mages I fought in Seheron tried to scare us with what they could do. Dorian looks like he's waiting for applause after every spell. Even Viv has this confident swagger, like she knows she's the most dangerous thing in the room. Vivienne (fabulously, if she's in the party): I am the most dangerous thing in the room, darling. Iron Bull: Yes, ma'am. Sorry, ma'am. Iron Bull: Not the quiet elven mage, though. No frills. Nothing to give you away... Half our targets never even see you coming. I really wish we could've seen Bull's expression later on, when Solas left—or better yet, when he realized exactly who we'd been traveling with. I think he would have looked, not surprised, but satisfied. Iron Bull: Something's funny about you. Iron Bull: Yeah. You talk about Grey Wardens and honor and sacrifice and griffons, but you're still not convinced. Iron Bull: Yes, you know what I mean. Blackwall: And you know this because? Iron Bull: I'm a people person. Iron Bull: Sounds like joining the Grey Wardens is like following the Qun. Blackwall: How do you think? Blackwall: I suppose I see the similarity, when you put it like that. Iron Bull: Little surprised I got there before you did, big guy. Iron Bull: How does being a Grey Warden work? I assume it's more complicated than just signing up. Iron Bull: And how is it that you're the only ones who can end the Blights? Blackwall: Is there a reason for the interrogation? Iron Bull: Curiosity. 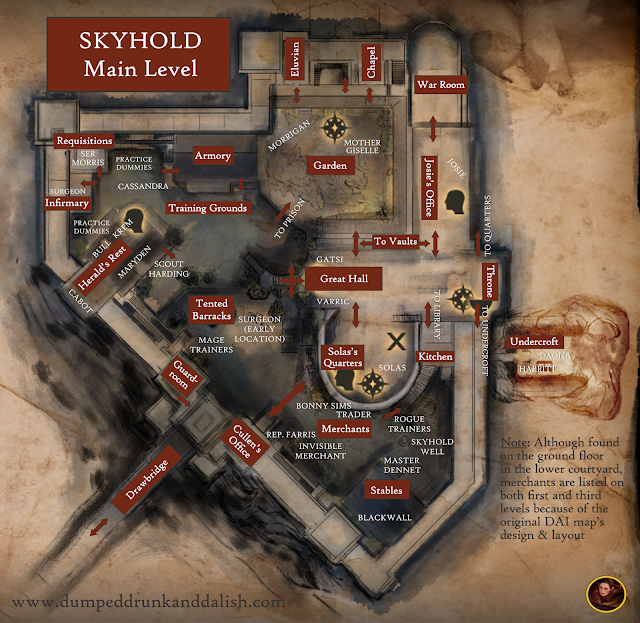 The Ben-Hassrath could know more about the Wardens. Also, those ogre guys, the darkspawn that look like messed-up Qunari? The Ben-Hassrath aren't pleased. Later on, if the Inquisitor has committed to a romance with Bull, there's a scene in which Bull and the Inquisitor engage in a little pillow talk about their companions, and Bull uses a key Orlesian phrase to refer to Blackwall, then notes, "There's a man who lived the good life once." And of course, he's not only right, it turns out that Blackwall has been hiding his identity, and that he is in fact Thom Rainier. Rainier was a highly placed Free-Marches-born officer in the Orlesian Imperial Army who was disgraced and sentenced to death in absentia after he participated in a paid political murder-for-hire that went wrong (ending in the slaughter of an entire family). Next time you play Dragon Age: Inquisition, these little moments are well worth revisiting. It's apparent that Bull was aware of potentially conflicting deceptions and motives in our companions far before we were... perhaps because he was keeping secrets of his own.